Date: Feb 20 2019, 9 a.m. - 12 p.m.
Class length: 2 sessions. 3 hours per session. Participants must attend both sessions. The challenge of successfully ushering children through their teen years has always been among parents’ hardest-won achievements. 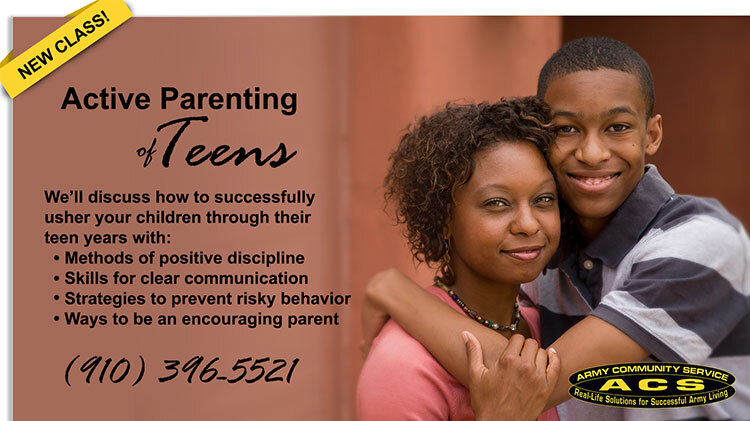 “Active Parenting of Teens” provides the guidance and support necessary to turn those challenges into opportunities for growth. In the class participants will learn methods of discipline, skills for clear, honest communication, concrete strategies to prevent risky behavior and how to be an encouraging parent. This 2-session class is free and open to DoD ID Cardholders and their Family members. Classes are held on the 3rd floor of the Soldier Support Center, Bldg. 4-2843 Normandy Dr.